When people wonder how millions of Holocaust victims went to their deaths without resisting, they display a total ignorance of the impeccable organisation, military might and web of deception behind the Nazi’s Final Solution. While there were multiple ghetto uprisings and a widespread network of Jewish partisans operating throughout World War Two, so brutally systematic and efficient were the death camps that – once trapped within their evil confines – organised resistance was virtually impossible. Today we recall an extraordinary exception. Like all of the other death camps, Treblinka adhered to a strict routine that supported the ruse of resettlement in order to feed hope and eliminate the chance of Jewish rebellion. Upon arrival, those spared immediate extermination in the gas chambers were transferred to the forced labour compound, where between 700 and 1000 prisoners at any time, nearly all Jews, were given the unimaginable task of aiding the smooth running of the extermination process. But somehow, within this Hieronymus Bosch-like realisation of Hell, a dream of resistance and revenge was hatched. The initial plan was to set fire to and destroy the entire camp, for which the prisoners were willing to sacrifice their own lives. But that changed when Jews from the recently fallen Warsaw ghetto began to arrive with “grenades and weapons in their pockets instead of tears in their eyes.” The incredible stories of the ghetto’s uprising allowed the Treblinka prisoners to dare to imagine their own survival in their revised plan: seize arms from the camp’s arsenal, set fire to the camp, escape in the ensuing chaos. By luck, a locksmith from within the rebel group was asked to repair the door of the camp’s arsenal and was able to obtain a wax impression of the lock. After four months, he’d fashioned a working key. Gasoline was also secured, which would replace the contents of the apparatus of the prisoner whose task it was to walk around the entire camp spraying disinfectant. With access to the arsenal and a means to ignite the camp, the date for the revolt was set for 2nd August. Most of the leaders of the revolt were shot and killed before they could escape from the camp. Those who got beyond the barbed-wire perimeter were relentlessly pursued by the SS and local police and killed on the spot. The gas chambers survived the revolt, and would continue to function until its last victims were claimed three weeks later. The camp would struggle on for a few more months but, almost entirely destroyed, it was dissolved by the end of November 1943. Only 60 of those who endured the horrors of Treblinka would still be alive at the end of the war. 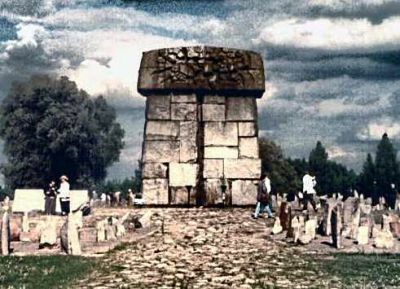 Although the casualties suffered were vast, the Treblinka Revolt miraculously succeeded in destroying the notorious death camp. The Jewish prisoners, having rightfully concluded that they were going to die in any case, chose instead defiance. I can think of no greater act of heroism. This entry was posted in Dissent. Bookmark the permalink. That was one of the most moving stories i have read. Interesting post. Sobibor was one of the other camps that had a rebellion and I think the Germans/authorities closed it in the end. This shows that resistance can bring results. It is important everyone know there was resistance at the death camps. I was taught/led to believe the people did not fight back, which I’d always had a hard time understanding. As it is the victors who write history I’m grateful and relieved to learn more of this reality. Should have known better intuitively. Thank you for spreading the word Dorian. Thank you, Dorian. Very much. No wonder your husband wrote what he did in this month’s Drudion. This is a serious accomplishment. I missed it first time around, but I’ll be checking in daily from here on in. As for this particular piece, I had no idea. Inspiring! A classic illustration of revolt! I suggest Dorian should compile all these inspiring heroic revolts and struggles into a book.